In this swap you will send five washi samples to two partners. 3) Wrap the tape around a playing card or something similar. 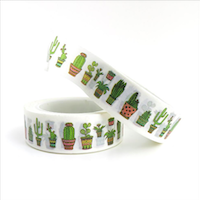 4) Please rate a 5 if you receive a minimum of five different 15 inch washi samples, of which at least three are plant themed. 5) Newbies are welcome, but empty profiles or unexplained/recent 1 or 3 ratings are not. I will check all participants before assigning partners and remove anyone who does not fit the requirements of the swap. Wait, do the plants really have to be green? Not necessarily! Green is the ideal colour palette for this swap, but red and orange autumn leaves, succulents of all colours and other such plants are perfectly fine.